The special additional prize was generously donated by Godstone Farm. The winning ticket holder will receive a 12 month adult and child annual pass. Godstone Farm has regular special events and on Saturday 6 April will have launched its Wiglet’s Easter Eggstravaganza for the school holidays, where there will be a full and family packed range of activities including admiring the new lambs and recently hatched chicks. Lottery tickets cost £1 and all profits go to good causes in the Tandridge district. Anyone buying a ticket can select the local good cause they want to support from those registered. Winners are drawn at random every Saturday, with the jackpot being awarded for a matching sequence of six numbers. Other cash prizes include £2,000, £250 or £25. 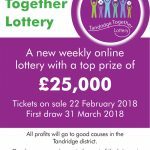 Since its launch, the Tandridge Together Lottery has had over 2600 lucky winners winning more than £26,000 worth of prizes. To buy tickets or register as a good cause visit www.tandridgelottery.co.uk. Residents who don’t have access to the internet can also take part by calling 01883 460555.